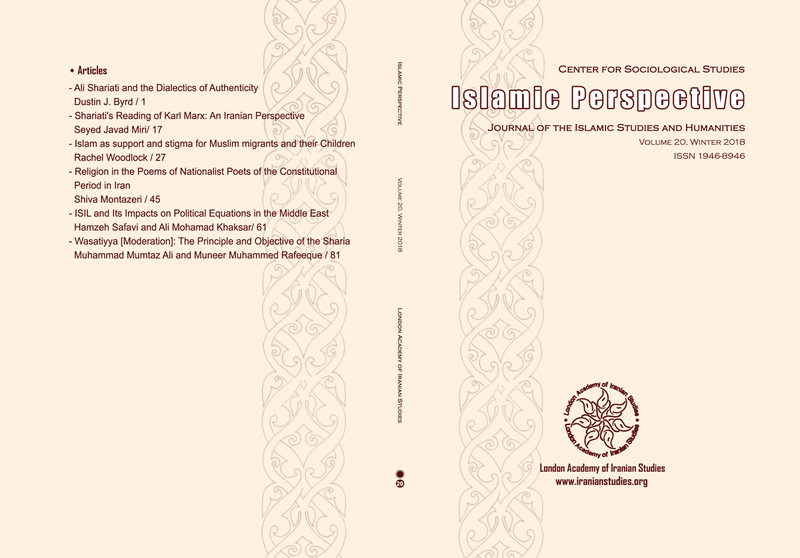 The Journal of Islamic Perspective published by the London Academy of Iranian Studies (LAIS) is a peer-reviewed Journal of the Center for Humanities and Sociological Studies, affiliated to the London Academy of Iranian Studies (LAIS). This Journal aims to create a dialogue between intellectuals, thinkers and writers from the Islamic World and academics, intellectuals, thinkers and writers from other parts of the Globe. Issues in the context of Culture, Islamic Thoughts & Civilizations, and other relevant areas of social sciences, humanities and cultural studies are of interest and we hope to create a global platform to deepen and develop these issues in the frame of a Critical Perspective. Our motto is homo sum; humani nihil a me alienum puto. Contributions to Islamic Perspective do not necessarily reflect the views of the editorial board or the Center for Humanities and Sociological Studies. To download the Electronic Version of the Journal click here.